Jess Clark reports on how North Carolina high school math teachers are adapting to the Common Core. 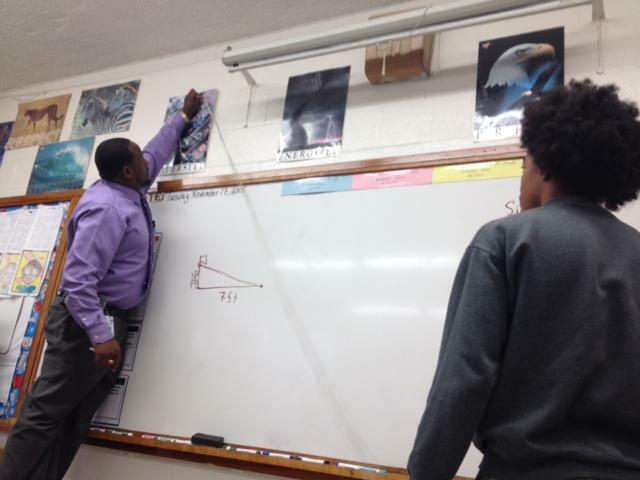 Math teacher Kenneth Williams climbs on top of a chair in front of his class at E. E. Smith High School. He hands a student one end of a string and asks him to hold it against the floor several feet away. The result is right triangle, a shape that’s immediately familiar to Williams’ students, who have been studying trigonometry. "So we know this is my right triangle. I’m looking for my height including the what?" Williams asks. "The chair!" his class responds. Williams has taught math for 20 years, and he says before the new standards, activities like this one were much less common. In this case, students are using both geometry and algebra. "Problems don't come separated into geometry, and then algebra and statistics. They come combined." The people who designed the standards say they are more in line with international standards and better prepare students for college and real-world problems. Jere Confrey is a math education professor at North Carolina State University. She was on the national validation committee that vetted and approved Common Core. "Problems don’t come separated into geometry, and then algebra and statistics. They come combined," Confrey said. "And the goal is that somebody figures out what to pull out of their toolbox for the circumstances they find themselves in." Research from NC State shows integrated math is especially good at engaging low-income students, and can help close the learning gap. But for many teachers, the transition from the traditional sequence to integrated math has not been easy. Math teachers who had been teaching only geometry for years, very quickly had to learn to teach algebra, and vice-versa. 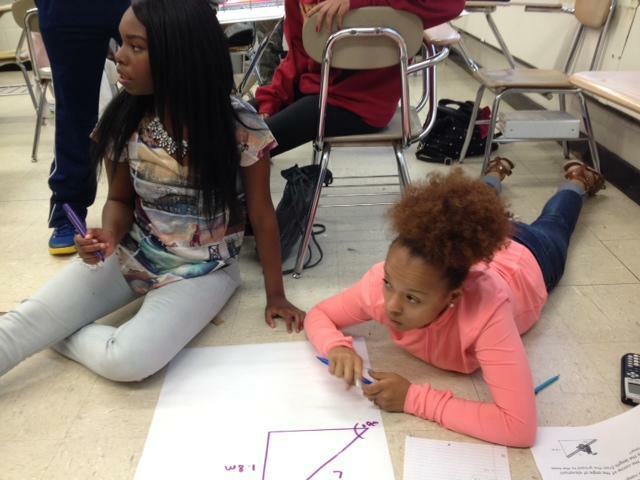 Students drew their own right triangles to model word problems. And most schools don’t have text books aligned to the new standards, so parents, Williams said, don’t have an obvious go-to resource for helping their kids. "One of the complaints I get is, 'We didn't do it this way when I was in school, and so I can't help them,'" he said. Williams says there’s an overwhelming amount of integrated math resources online. But they require teachers and parents to be more proactive. "Just the problems these kids got today, I had to pull from about five or six different resources," he said. A state commission appointed largely by Common Core opponents found in a survey that almost 70 percent of North Carolina high school math teachers, principals and superintendents want to return to the traditional sequence. Commission chair Andre Peek says the high school math standards are unclear. "Just the problems these kids got today, I had to pull from about five or six different resources." "So what we’re saying is if you’re going to fix the standards so that they are coherent concise and sequenced correctly, then the fastest way to do it would be to do back to the traditional track because that was all in place," Peek said. Confrey says she recognizes there are some issues with the integrated standards. But she thinks they can be solved by making small adjustments and getting teachers more training. "It seems to me our obligation is to bite the bullet and get that kind of support out to teachers, recognize that their concerns about their ability to teach this, for some teachers, is valid. But that’s not a reason not to do what’s better for the kids," she said. Back at E.E. Smith in Fayetteville, Williams also wants the state to stick with integrated math. He said his students are more engaged than before, especially students that haven’t been drawn to math in the past. 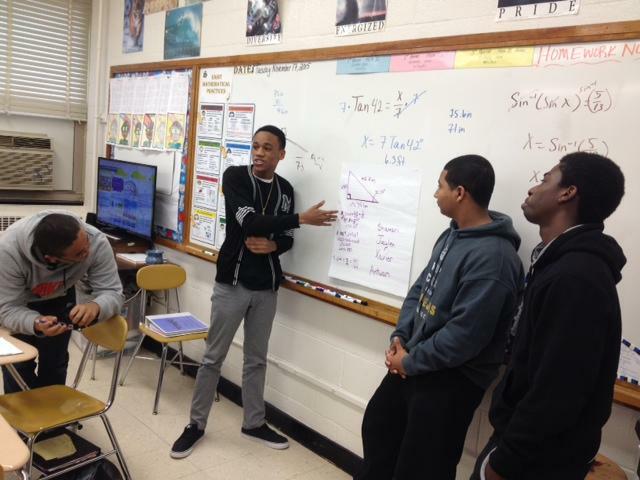 Shamari Miller presents his group's solution to the class. By the end of William’s third-period class, small groups of students have drawn their own right triangles with markers and paper to model word problems. Shamari Miller is presenting his group’s solution at the front of the room, taking questions from his classmates. At least in Williams’ class, kids are getting it. But not all teachers are as confident as Williams in teaching integrated math. It turns out implementing a new state standard is a lot harder than solving for x.